The month of April was HELL. Finn was at a barn with two mareish mares, and an older gelding. He was turned out in a very small paddock. 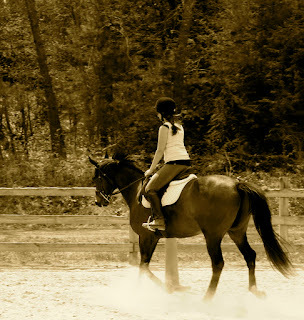 I had him on rough board, and between having a baby, a job, the commute to the barn, and all the work that comes with rough board, I was not riding him as much as I should have. ...And he developed a rearing problem. Every time he was led out into his tiny paddock he would dance around on the lead and as soon as the barn manager went to remove his halter up he would go. Every. Single. Day. I was only up there once in the morning to turn him out myself to witness it. And I was completely terrified. Rather than calling a trainer, I almost thought about returning him to the MSPCA. I don't know why I didn't call a trainer. I was so burnt out from just about everything that I couldn't even think straight. Whenever I did have time to ride, the weather wouldn't cooperate. The barn manager said I HAD to do something about THIS HORSE because she couldn't handle him. "This horse" that I swear I had made a mistake on. He was a wild, unruly, complicated, Thoroughbred. I had a baby and husband at home that depended on me. What was I doing with a horse?! If I could have done it different I would have gotten a trainer as soon as I got him. I would have worked more on groundwork with him. But instead, I decided to move him. I moved Finn to a full board barn close to home in May. The barn was a bit rundown, there was only a fenced in grass ring, but the stalls were spacious, the turnout was huge, and I really liked the barn manager. Finn settled in quickly, and on all day group turnout his rearing habit completely went away. I had my old barn manager's farrier up for a trim and new shoes and it was a terrible experience. This farrier was not one to put up with any crap, and insisted on a chain around his nose and an hour+ of lunging him in the rain to settle him down. Of course this didn't settle him down, it only made him more agitated. After a 3hr farrier job I was left with my poor, trembling horse. Rather than trust my own instincts I immediately thought my horse needed more groundwork, someone better than me to work with him. In June I started riding more consistently...of course...when the weather was the hottest and the bugs were at their worst. I was having fun getting to know Finn and we started jumping some baby crossrails and working with a hunter jumper trainer. In July a new horse moved to the barn and Finn started getting beat up in turnout. I would pull him in from the paddock only to discover another new cut on his sides, neck, or back. I decided to move him to individual turnout. I also decided to try out a new farrier who took a much more gentle approach with Finn, who, in turn behaved like a perfect gentleman. At some point in July Finn injured himself in turnout. I don't know whether he tripped, rolled on a rock, or what, but he was very back sore. Our new farrier came to put on a loose shoe and when I told him I was thinking about moving Finn to a new barn with safer turnout and better amenities he suggested I check out the barn that his girlfriend boarded her horse at. A big negative to the barn though was that it was an hour commute. My husband and I decided to check it out anyway mid-July. Upon pulling up the long dirt driveway there were horses in large turnouts to our right, a big blueberry patch to our left, and the big wooden barn in front of us. With 30+ stalls, a washstall, bright aisles, an outdoor with a full jump course, a huge indoor, and miles of endless trails right from the property we were sold. On August 1st Finn moved to his new home and was almost immediately turned out with his new herd of five other geldings. He galloped a few circles around the paddock and settled in as if he had been there forever. I knew that we were home. During the month of August I had two chiropractors up, a vet test for Lyme, and a massage therapist out to tell me that my horse had done something to his back. I also had a saddle fitter out to adjust my saddle. After a week of stall rest and a week of bute, one of the many things that I had done to try and help him seemed to work. We started taking lessons with the barn manager, and Finn got his first bath in the wash stall. Excited to read more about you guys!